Try this, On our way to school and back, me and my son sing songs. We sing all the possible songs that come on the radio. When we are waiting on the signal other people sometimes give me a smile back and enjoy the moment with us or Sometimes give me a look saying I have lost it, but does that matter? what matters is the vibrating laughter of my son when he sees his mom singing is all funny or over the top voices and joints in mimicking how dori the fish would sing that song. My son had taught me to enjoy everyday. Thank God! it is not the other way cause if children learn to live from us adults they learn to be gloomy, serious, fearful, manipulative and about 100 useless adjectives which will take away their innocence and childhood. I am really happy that my son has given me the gift of laughter. We laugh silly when someone berps or farts or when he wants to become superman by wearing his underwear over his track pant and in this costume he is zooming round and round in our living room. He did get annoyed at me when I said no to him as he wanted to go outside wearing that red flash underwear over his green track pants and show it to the neighbours around. May be he wanted to impress our neighbour’s daughter but I think if she had seen him like that she would have freaked out. Lolz. 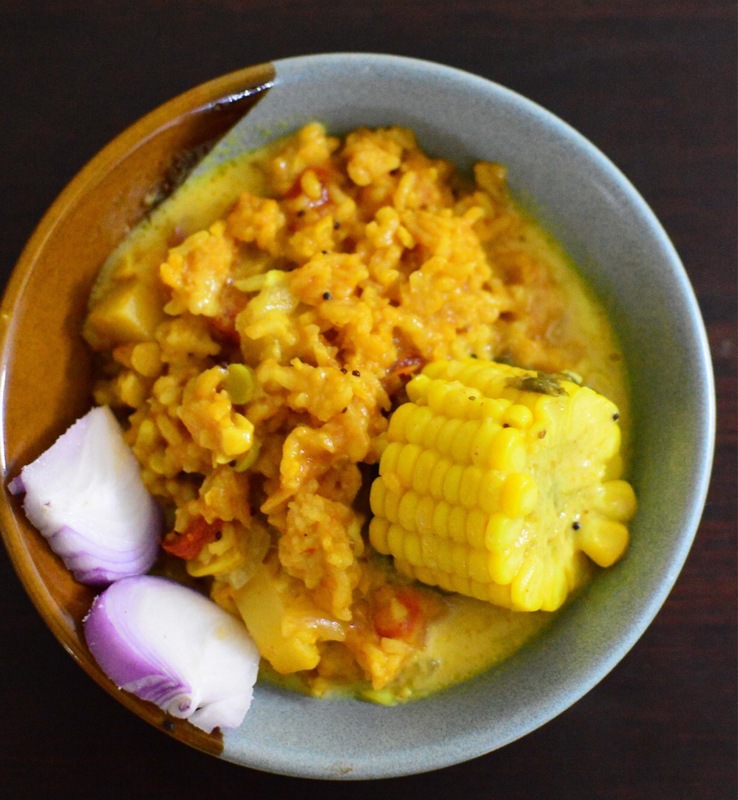 As it is winter, we enjoy having hot sizzling curries with rice and kichadi and for some reason we made a lot of corn curries these past few days.. 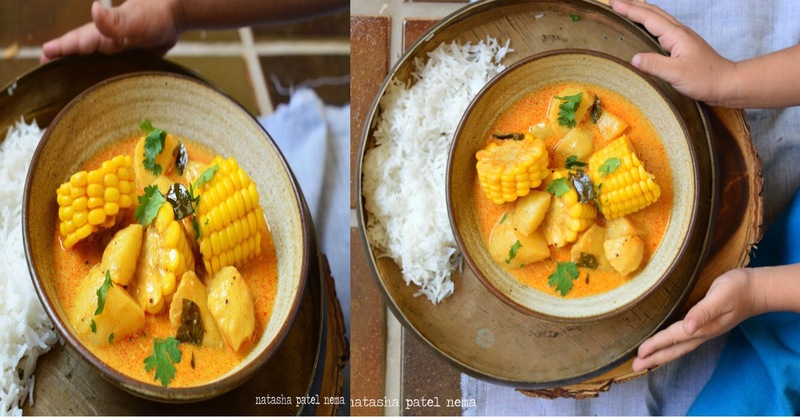 This corn coconut curry my mom saw from a cooking show. I first ate this at my parent’splace. My plan was to cook when my son naps but this particular day he refused to sleep. Its a perfect recipe to share. 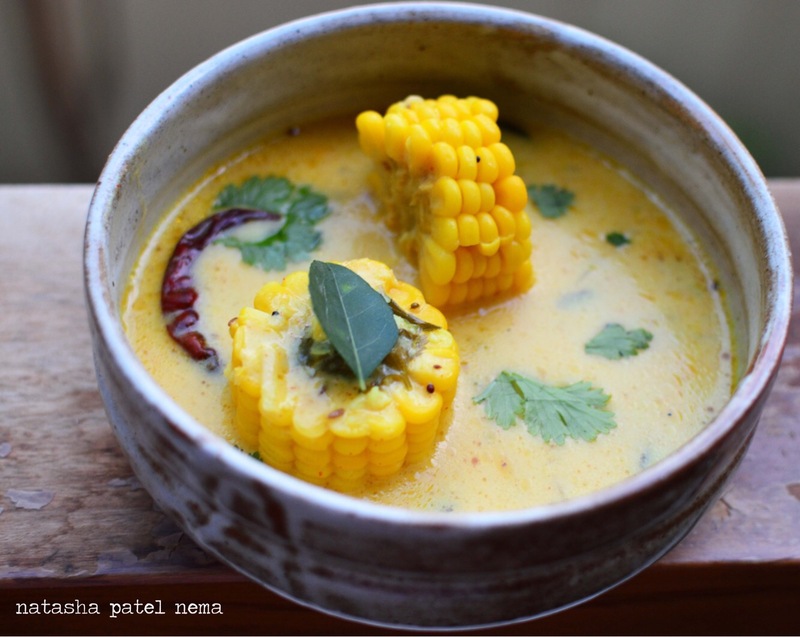 The chef’s tip is before the curry boils keep on stirring continuously and after that simmer for an hour. Well I never have time so I simmered for 30 mins. Heat the oil and add cumin, coriander seeds and ajwain. stir but do not turn them brown. Add red chilies, green chilies, curry leaves, Ginger garlic paste. Now add the buttermilk mixture. Bring it to boil. Simmer for an hour. Add the corn and bring the mixture to boil. 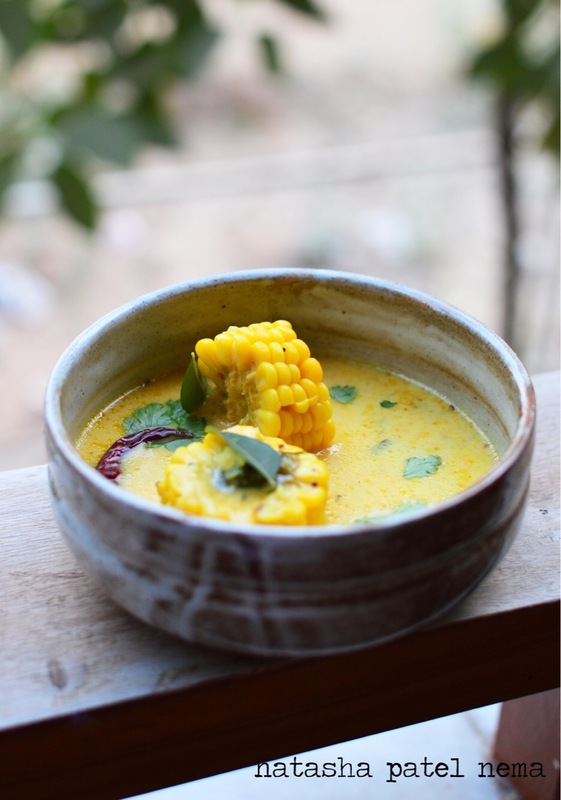 This recipe is basic for rajesthani kadhi. Your options are unlimited have just the curry, add pokaoda or gatta or what I did.. 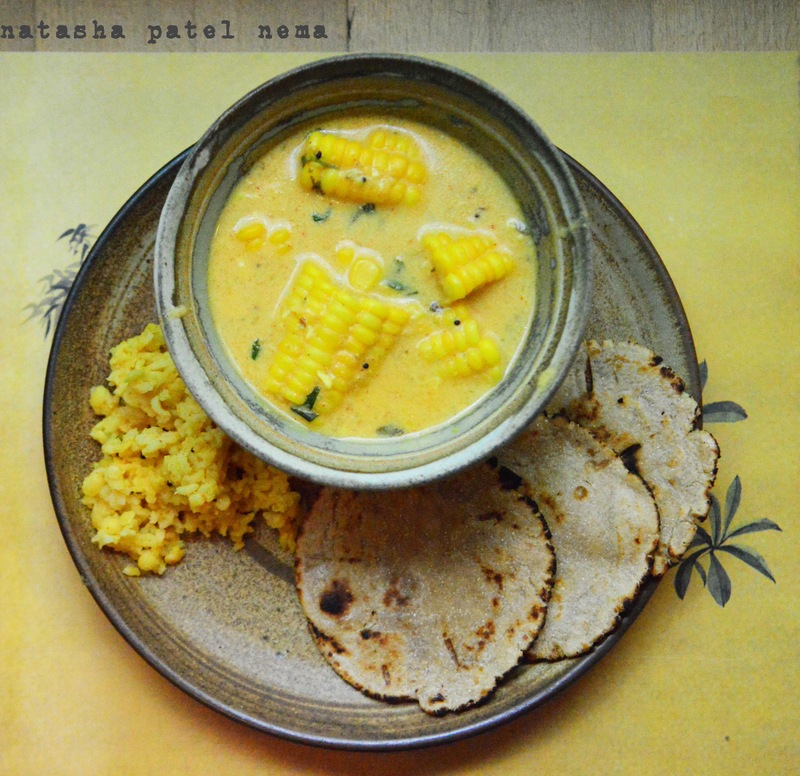 This recipe I have shared on this blog earlier.. This looks delicious. 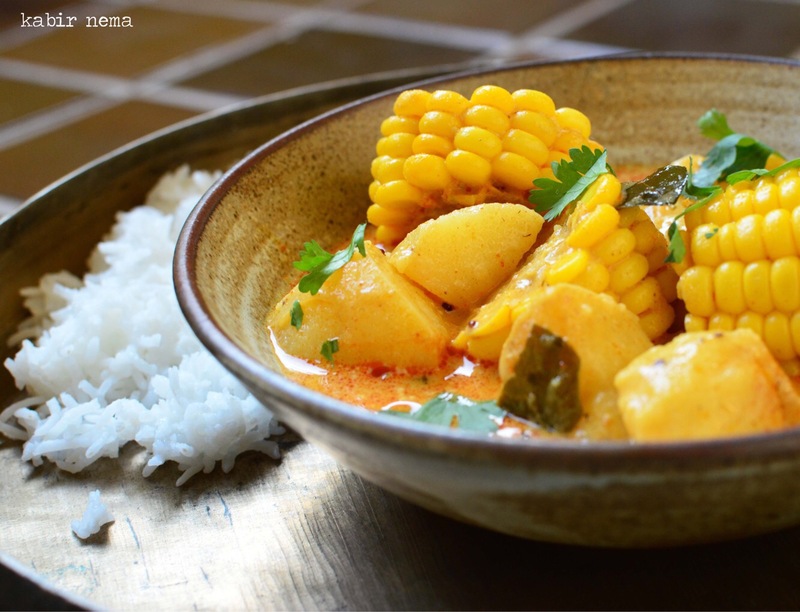 I love curry! I also sang with my kids when we were driving to and from school! My daughter still asks me to sing some of those songs – and she is now 30! Absolutely. My mother sang to me, too.